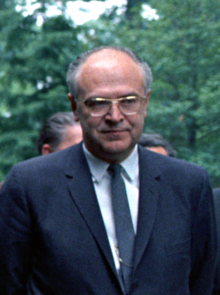 Anatoly Fyodorovich Dobrynin was a Russian statesman and a Soviet diplomat. He was the Soviet Ambassador to the United States. He served during the Cuban Missile Crisis. Dobrynin worked with 6 American presidents. He was well liked in the United States. ↑ "Anatoly Dobrynin obituary". The Guardian. 16 April 2010. Retrieved 22 September 2016. This page was last changed on 4 February 2019, at 22:25.